Miranda, Languido Champions of MILO Davao | JustRunLah! DAVAO CITY – A new leg champion was crowned while another is back on top at the close of the 41st National MILO Marathon Davao qualifiers last at the SM City Davao last Sunday (October 22). Richeel Languido and Judelyn Miranda will now lead the city’s representatives to the National Finals this December 3 in Cebu City. 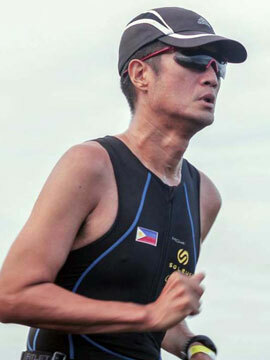 Languido finally nailed a MILO 21-kilometer title as he crossed the finish line in 1:15:14 as he took over the throne held the last three seasons by Sonny Wagdos from 2014 to 2016. Far behind was last year’s runner-up Michale Jan Echalico in 1:18:20 followed by Arnie Macaneras at 1:20:19. Also finishing in the Top 10 was noted para-athlete Isidro Vildisola. He finished in an inspiring 1:29:56 and good for Eighth Place. Miranda returned to the top of the Women’s Division with a clocking of 1:32:07, retaining the honor she held from 2014 to 2015. Miranda, who also topped the 2013 Butuan qualifiers, was too fast for chasers Vivian Avergonzado (1:41:38) and Lalaine Patricio (1:42:30). In the side events, Arlan Arbois (34:50) and Diana Memoracion (43:25) topped the 10 kilometers. Dylan Mark Daban (14:18) and Andrea Deguia (17:20) won the five kilometers while Aaron Gumban (11:06) and Danica Ambat (13:45) took the three-kilometer children’s race for ages 12 and below. The MILO Marathon will take a brief break and resume the qualifiers with the penultimate race on November 12 in Butuan City. The last qualifier will be host by Cagayan de Oro on November 19.